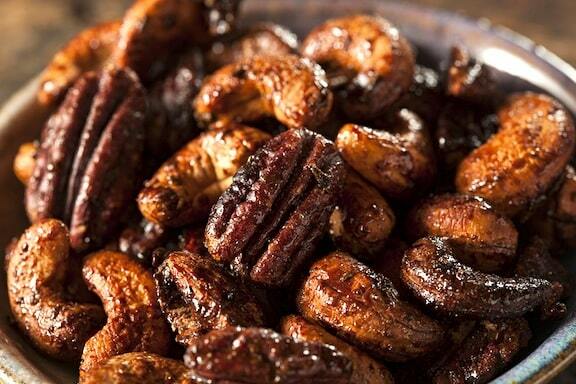 Deliciously glazed and spiced nuts are a tasty finger food at special occasion, or as an everyday snack. Use any combination of your favorite nuts—peanuts, almonds, pecans, walnuts, macadamia nuts, cashews, etc. Combine the agave or syrup in a medium mixing bowl with the cinnamon, ginger, chili powder, salt, and nutmeg. Whisk together. Add the nuts and stir to coat. Spread the nuts in a foil-lined 9×9-inch baking pan. Bake for 20 minutes, or until nicely glazed and toasted. Let the nuts cool, then break them apart. Stir in the optional cranberries or raisins and toss together. Transfer to a serving or storage container. So sorry this didn’t work out for you! I’m not sure why that would have happened. I haven’t made this for a while, so maybe I’ll retest so I can wrap my head around what might have gone wrong. I will be back to you shortly! And thanks for your kind thoughts.